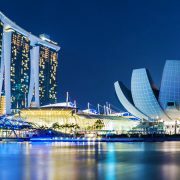 A world-first initiative to drag an entire jurisdiction into the digital age is under way in Singapore. The Future Law Innovation Programme (FLIP), organised by the agency responsible for developing the country’s legal profession, will encourage firms to adopt new technology, bring lawyers and entrepreneurs together and help ‘lawtech’ startups. FLIP, launched last week by the Singapore Academy of Law, is part of the Legal Technology Vision, a five-year plan put together by representatives of the judiciary, the Ministry of Law, the attorney general’s chambers and private sector lawyers. The aim is to tackle the paradox that, in one of the world’s most digitally minded countries, much of the legal profession remains in the paper age. Paul Neo, chief operating officer at the Singapore Academy of Law, said that a particular problem is the structure of the sector: ‘80% of legal practices have five fee earners or fewer,’ he said. Such practices have little time to adopt new ways of working. Under FLIP, firms will receive up to 70% of the cost of new technology to re-engineer their working practices. The programme also includes a Legal Innovation Lab across the road from Singapore’s Supreme Court. A third component, south -east Asia’s first legal tech accelerator to groom promising legal tech start-ups, will be opened in April. The programme will be piloted for two years.